SDFC are proud to announce our return to Golden Goal in Lake George NY this year after a fantastic first year in 2016. Visit our Facebook page for photos and videos of our residential camp. Located in the Lake George region of upstate New York, the facility benefits from majestic views of the foothills of the Adirondack Mountains with endless blue skies, starry nights, bordering farms, and fresh mountain air. The ability to focus puts Golden Goal in a league of its own. Athletes, teams, and coaches visiting our Golden Goal location are part of an extraordinary and remarkable experience in advancing their athletic pursuit. An Olympic-inspired residential Athlete Village, eight state-of-the-art fields (including four Golden Goal Turf™ fields with professional lights and sound system) and four carpet-lush grass fields. This, plus a 5k Challenge Course that weaves through the back woods and bordering trees, tests one’s stamina and teamwork. There’s also an on-site medical facility, as well as concession stands, gear shop, coaches’ lounge, players room for down time activities, camp events and evening activities and much more. The fantastic location and great playing surfaces allow for excellent sessions to be run by SDFC staff. Golden Goal also include a great opportunity to have state of the art "drone" footage for any scrimmage and session desired by the coaching staff for players and parents to see. Each team will have the chance to play at least 1 scrimmage against a local opponent during the camp. Please ensure all documents are returned to by August 1st 2018. Yes. You can make an initial payment and remaining balance at a later date. When you register you will see 2 options, FULL PAYMENT, PARTIAL PAYMENT. Yes, 3 meals per day from a great range of foods prepared daily by trained chefs. Additional foods are available. Medical dietary needs/requirements are available for request 21 days prior departure. No! SDFC will have a luxury bus company take all staff and players to camp and back. Where will my child sleep. Will they be with friends? Each Cabin sleeps up to 18; staff will be allocated to each cabin to ensure safety and security. 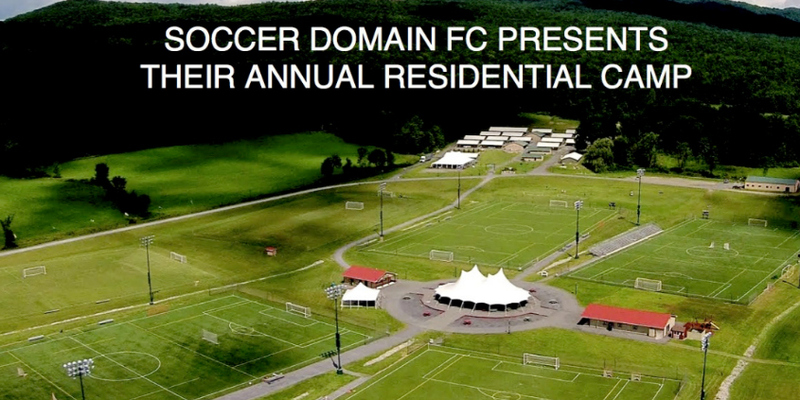 SDFC Would like all players to feel comfortable at the camp and this will not be an issue. Please note boys and girls lodging and washroom facilities are separate. No! But there are opportunities for players to purchase additional snacks at the concessions. Please note, concession stand foods will not be a suitable option for a meal replacement. If my child is homesick can I call them? Yes, the staff are always with the children. Parents may contact their child during the day as well as contacting an SDFC staff member if child does not have a cell phone. Yes, Golden Goal have medical staff on site for our entire stay. Yes, SDFC staff will be first aid trained, the nearest hospital is only 12 miles away. Can I be a chaperone and what does that involve? - Yes, parent chaperone's can attend this event. - Chaperone's are to assist the SDFC coaching staff during (off field time at the cabins). - Chaperone's costs is $399, this covers the adult meals and accommodation at cost. - Chaperone's are more than welcome to travel via bus or take own transport. - Chaperone's can leave the camp and enjoy their time while the kids are training.